with this My Rockin’ Collection! 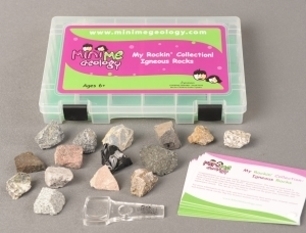 Igneous Rock Kit from Mini Me Geology. You will learn about intrusive rocks that were made by underground magma and extrusive rocks that were made by lava after it erupted from the volcano. You will also uncover the mineral content, common locations and uses of the igneous rocks as you observe and test your samples. The name of your igneous rock is hidden below a foam pad in each sample compartment so you can test your identification skills and check your results. Kids and teens love this kit because of the unique colors, textures, and properties of the igneous rocks. Teachers and parents love the kit because it teaches experiment testing, deductive reasoning and thinking skills.